A CIA agent kills a werewolf in a spooky castle. He retrieves its blood for a secret project to make super-soldiers. The test doesn’t seem to work, and frustrated, the agent injects himself with the blood. He gets faster and stronger, but feral, and one of his superiors is forced to put him down with some silver bullets. He is then cryogenically frozen. Twenty years later, scientists working on a metal material than can replace human skin are given the (unknown to them) werewolf body to experiment on, because, if you have a werewolf, the first thing you want to do is cover it in living steel. Once thawed out and free of the silver bullets in its chest, the werewolf rampages again. 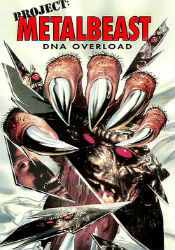 I appreciate the ambition of Project Metalbeast, lots of people might talk about making a movie where the heroine fires silver tipped rockets at a half-metal werewolf, but this film actually goes through with it. There is quite a bit of over-the-top comic book imagery. Barry Bostwick easily walks away with the movie, by being such a nasty piece of work. The biggest flaw of the movie is that it never quite seems to build up enough momentum to be the crazy spectacle that it wants to be. Where it needs to have some lean and propulsive storytelling, its ends up being flabby and talky. Project Metalbeast has a lot going for it, but it is a near miss.